Above all, we want this website to be an inspiration to ordinary people who believe in serving the needs of children without families in the name of Jesus. We do not claim to have every answer for you, but we do claim to be able to speak from our experience and call. Hope For 100 not only has a story, but it also has a local story of what God is doing among many families and churches in the East Texas area. We want our readers to feel that they are connected to us and that we provide more than just information, but rather, as a ministry, we aim to provide a local and real presence in all things to do with adoption, fostering, and orphan care. 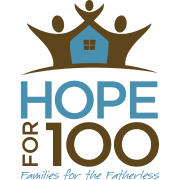 Hope For 100 exists to glorify God by helping equip churches to fulfill the Biblical mandate of caring for the fatherless through adoption, foster care, and orphan care. Each Hope For 100 campaign challenges and supports individuals and churches to obey God’s Word and provide loving, Christian homes for 100 children through adoption or foster care. Raise awareness of the plight of the fatherless. Issue a specific challenge to the Church to care for a specific number of orphans through adoption and/or foster care. Match interested families with experienced foster and adoptive families for guidance and encouragement. Promote opportunities to serve through an ongoing orphan care ministry. Help provide the necessary funds to families seeking to adopt. THE BIBLE DECLARES THAT PURE RELIGION IS TO CARE FOR THE FATHERLESS. As you learn about Hope For 100, we pray God will reveal His heart to you for these precious children. Blessings surround those who join God in His mission. There are many children without hope in the world right now. You may be exactly what they’re hoping for!